Planets in Star Wars films often challenge scientific standards of real life environments and their resulting soil surfaces. However, these intriguing lands, even if geologically odd, are truly fun to imagine and of course, to notate. Desolate and remote, this Star Wars planet is primarily covered in sodium rich salt. There are some mountains and canyons, but the white of the salt flats dominates the color landscape. The lightweight and slick nature of the salt means wind storms and slippery surfaces could make for difficult conditions when traversing the land. Underneath the white salt surface of Crait, is a rich red soil, noticeable when a human walks across the salt flats, revealing red footprints, or when spacecrafts trail plumes of red dust as they fly close to the terrain. What makes this color shift from stark white to blood red? As Volcanologist, Robin Andrews suggests, it could be “potassium chloride in mineral form” or “fossilized remnants of red algae”. 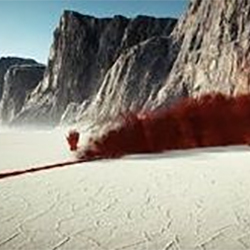 Ken Herkenhoff, an astrogeologist suggests the red may be a sign that the planet Crait was once covered in a sea of salt water. High oxygen levels on the planet could have resulted in oxidation, due to the “interaction of oxygen and iron.” All possibilities we took into consideration when coming up with a set of color notations for Crait. The salt flats where the film was shot are located in Salar de Unyuni. The largest salt flat in the world, its unique gypsum surface ranges from a pale yellow-green white to a grey or brownish white. Although you won’t find the red dust under this real life salt pan, we took liberties here to imagine the colors ranging from marsala to blood red. Perhaps deeper layers would reveal lithium rich volcanic soils... but we will leave those to the imagination. Are you a Star Wars fan and a soil scientist? Have you run an analysis of a planet and want to see it notated. Then give us a shout out – we would love to get your help. Who knows, maybe someday we will have an Interplanetary Soil Book of Color.